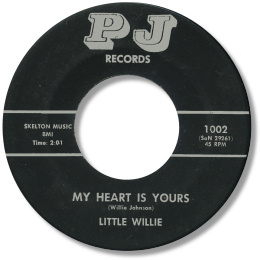 One of the great unknowns, Georgian Willie Johnson has only cut a handful of 45s to date, but every one is highly sought after by those in the know, as his name on a disc is a sure sign of quality. His voice had that gritty quality that southern soul fans love, and a power and presence, with the feeling that he had so much in reserve, that only the very best of the gospel based artists achieved. His first secular disc was the deep My Heart Is Yours. This had a fine bluesy guitar accompaniment and some nice horn touches, but the key is Willie’s gruff tones, even at this early stage in his career (certainly no later than the mid 60s) showing a wonderful sense of dynamics. His Vendella’s 45 Darling Let's Love may just be the Most Wanted deep soul disc of them all –and no wonder. This dead slow 6/8 ballad, with all the standard trimmings of piano, guitar, horns and a sympathetic female chorus, is really just a showcase for Willie’s hoarse vocals. This is a tour de force, what deep soul is all about, particularly the way he “calls his baby” after a very short rap in the middle. Quite outstanding. The easy mid pace of “That’s How It Is” is a fine southern side, and even better than that is Willie’s second masterpiece It’s Got To Be Tonight. One of the very best songs that Clarence Reid and Willie Clarke ever wrote, Johnson raises the “Steal Away” theme to amazing heights through his voice - now almost a whisper, now a full throated roar, he is simply unstoppable. To hear just what a difference he makes to the tune, check out Eddie Lovette’s version (Steady 004). This uses the same instrumental track but good as Eddie is here he can’t hold a candle to Johnson. Clarence Carter’s Future Stars label was a source of very fine music during its rather short life, and Johnson’s own contribution is a really excellent double sider. “Left Over Love” is a a strong minor keyed beat ballad with just a hint of funk, and his cut to Clarence’s deep I Can’t See Myself is almost on a par with the superb original – and that is high praise as I consider Atlantic 2461 amongst the Great Man’s very best cuts. 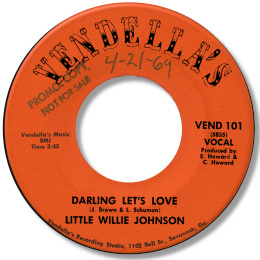 Johnson’s only other 70s recording was a cover of the old warhorse Glory Of Love. This is treated with all proper respect – a very churchy organ/piano combination is supported by a tasteful guitarist, and the occasional tenor sax fill – and Willie is on his very best preaching form. Love the Big O references too. As near perfect as you can get. He returned in the 80s cutting some further sides in his home state. 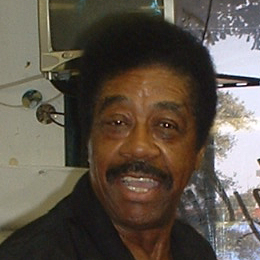 Of the Otis R covers, “These Arms Of Mine” wins hands down over the disco beat of “Respect”. It really is a fine version of a personal favourite number. The jaunty upbeat “What Am I Going To Do” is actually very good, and worthy of DJ’s attention, although Johnson’s occasional full-on roar might frighten them to death. “It’s Me” is a grower of a slowie and the strings give it a much more uptown aspect than is usual with Johnson’s work. But that wonderful set of pipes remains the focus of the disc. As for his gospel recordings, there is considerable conjecture. Is he the Willie E Johnson who sang lead and also wrote a couple of numbers on the Checker LP “Listen To The Morning Stars Of Savannah”? Is this the same Rev Willie E Johnson who recorded the True Spirit album “If Mama Could See Me Now”? Can anybody help here? 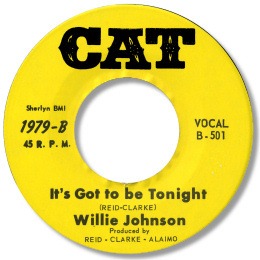 Whatever, Willie Johnson is a soul singer who should command the absolute respect of every fan. They really don’t come much better. UPDATE ~ Nayoa Yamauchi reports that there are two versions of "It's Got To Be Tonight, one of which is about 30 seconds longer than the other. The records look identical but the matrix numbers are reversed - either "B-501" or "501-B" which is the longer cut. I'm grateful for this new piece of info. NEW UPDATE ~ Dave Chichester and Kevin Briscoe have written to say that Jazzman UK have reissued the Vendella's 45 in a limited edition for the dance market interest in "Loneliness". FURTHER UPDATE ~ Naoya Yamauchi has clarified the gospel recordings Willie has made. He says that the guy on the Checker LP and the True Spirit LP are indeed the same Willie Johnson - Naoyoa adds that Willie is also singing on the LP "The Morning Stars of Savannah, Georgia - I've Been Blessed By The Hands Of The Lord" (Savoy 14518). Although Willie sang on these recordings he was not always a member of the gospel group itself but joined them from time to time as a sort of "guest singer". I'm grateful as always for Naoya's info and knowledge. Note - Willie has stated that the Del Royals sides on Mercury (Man of value / Come back pearl ~ MERCURY 72070 & Some kind of wonderful / Come back pearl ~ MERCURY 73012) are not by him. Thanks to Matt Starr, Brian Poust for help, and to Dave Porter (see Links) for the Del Royals info. And to Garry Cape for the photo of Willie in his kitchen!